Another mish-mosh of notes for this Wednesday. Auburn took care of business against Samford last night, cruising to an 11-4 win. In total Auburn used 6 pitchers: Stephen Kohlscheen, Slade Smith, Zach Blatt, Ty Kelley, Sean Ray and Jon Luke Jacobs. The Johnny Wholestaff approach was definitely in full effect. However, notably absent from Johnny Wholestaff was Cole Nelson. When Cory Luckie had his road to recovery, Pawlowski used to midweek starts to accurately gauge his return. Nelson, however, didn’t pitch Tuesday (which would have been his #2 midweek start). We’ll have to see how the rotation shakes out this weekend against Arkansas. We know Dayton and Luckie should be there. That third slot will be the toss up and still between Cole Nelson, Slade Smith, Dexter Price and two additional wildcards: Stephen Kohlscheen and Jon Luke Jacobs. I’d say, for now, Jacobs is an extreme longshot. He’s just coming back from injury and did look a little shaky last night. 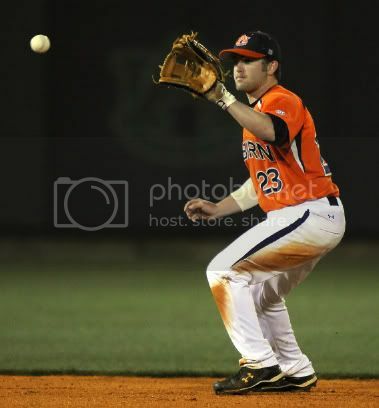 Who knows what to do with Auburn’s 3B position. Gamache still remains the best option at the plate (evidenced by his 3R HR last night). However, Wes Gilmer is better defensively and last night Gilmer had a solid night (2 for 2 with 1 rbi and 1 run) in a substitution role. The majority of Auburn’s pitchers looked good last night. Pitching out of jams and only giving up a few mistakes here and there. Overall, a good tune up. Last night’s win was the first over Samford at home since 2007. That’s just mind boggling to me. The weather report from Fayetteville isn’t looking good. 95% chance of strong storms this Friday. These midweek games are ripe for upsets. None bigger than New Orleans, a team Auburn dispatched easily, upset LSU (in Baton Rouge) by scoring 4 runs over the final two innings. Vanderbilt lost to Austin Peay 5-4 thanks to a game tying grand slam from the Governors. Ole Miss got all it could handle from Murray State, watching the Racers claw back and tie it after being down 10-1 and Ole Miss winning it in extra innings.